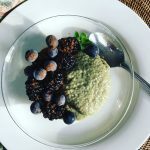 Simple and delicious, matcha powdered chia seed pudding is a great way to enjoy plant based protein, green tea antioxidants and start your day with a powerful and satisfying combination of nutrients. What you eat counts. Your body was brilliantly designed to last a lifetime, and continue to amaze and delight you. Breakfast sets the metabolic tone for your entire day. If you eat high dairy, sugary, starchy or processed foods first thing in the morning, your blood sugar will spike, giving you a sugar rush followed by a midmorning crash. It is even worse to entirely skip breakfast and just have a cup of coffee; especially if you want to lose weight. Statistically, people who eat 600 calories for breakfast lose more weight and keep it off, than people who eat 200 calories or less. Eating the right combination of foods in the morning means that you can lose more weight and keep it off. Breakfast is one of the most crucial habits to develop to keep your body and brain functioning optimally. It is vital to fuel your body up at breakfast with healthy fats, fiber, fruit and vegetable acids and enzymes, and lean or plant based protein. Adding protein and healthy fats at breakfast slows stomach emptying, and helps suppress the production of ghrelin. Ghrelin is a hormone produced by specialized cells that line the stomach and pancreas, and it is one of the main hormones to stimulate hunger. Leptin, the hormone that counteracts the effects of ghrelin, is produced by the fat or adipose tissue in the body. When your leptin level is high, your hunger is low; and when your ghrelin level is high, so is your hunger. I have had so many people tell me that eating breakfast makes them more hungry later in the day. This is true if you are eating the wrong things in the wrong combinations. 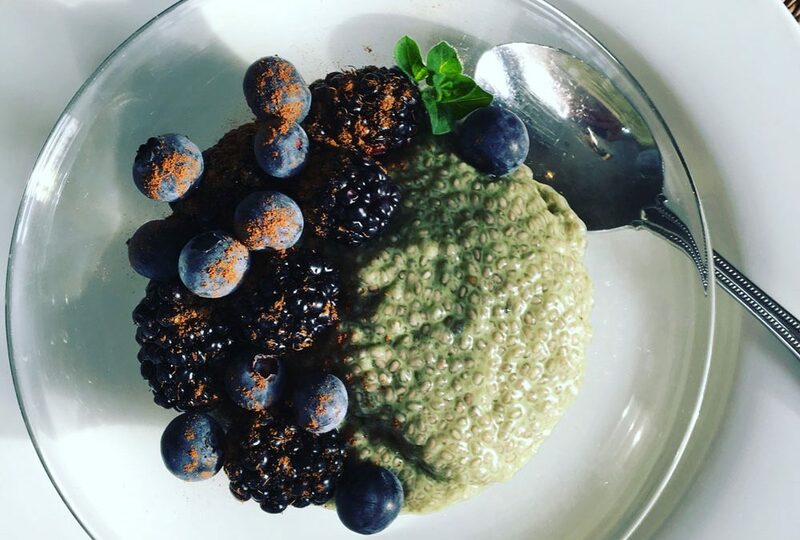 You want to use the right fuel in your body for maximum performance and Matcha Chia Pudding does just that! Chia seeds are the highest plant based source of Omega 3, fiber and protein. They are also loaded with antioxidants, vitamins and minerals and make the perfect plant based way start to your day. Combine almond milk, matcha powder, vanilla and maple syrup in a mason jar. If you have a blender bottle add the blender ball to the Mason jar with the other ingredients. Add chia seeds and shake vigorously. You don't want the seeds clumping together, the blender ball will help with this. I like to serve the chia pudding topped with berries, pomegranate seeds and toasted almonds* or a healthy granola. *Almonds provide a whopping 7.4 milligrams of vitamin E per 1oz serving and they are a great source of beneficial monounsaturated fat.